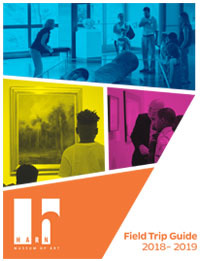 The Harn Museum of Art offers various tours for audiences of all ages. All tours are offered at no charge, but a $3 donation per person is suggested to support the work of the museum. For more information, contact our education department at 352.294.7062 or email tours@harn.ufl.edu. Tours may be scheduled Tuesdays - Saturdays 11 am – 4 pm, and Sundays 1 pm – 4 pm. At least three weeks advance notice is required to schedule a tour. A maximum of 60 participants may be accommodated at one time. Organized groups of at least 10 people or college-level classes may schedule a docent-led tour. More information regarding resources for college classes is available on the University Educator section of our website. The Harn offers docent-led tours with a discussion and inquiry-based learning approach for students in all grade levels and subject areas. Choose from one of our “School Tour Programs” or customize your visit to directly relate to themes and topics being explored in your classroom. School groups may tour the museum Tuesday - Friday 10:30 am to 3 pm. For detailed information and planning tips, see our Field Trip Guide and School Programs page. Groups that prefer to self-guide the museum without docent educators are welcome to visit during our regular hours of operation Tuesday - Sunday. To avoid scheduling conflicts with other programs and tours, please contact the museum at least one week in advance of your visit. Suggested activities for self-guided student groups are available at this link. Enjoy friendly, docent-led discussions on Saturdays and Sundays from 2 - 3 pm. No registration required – tours start in the museum’s lobby. Docents share highlights from across the museum, spotlight a special exhibition or explore a specific theme. More information coming soon. Tele-Tours, interactive video tours, are available for Veterans and active duty military, and their families. These tours serve families who are not able to travel to the museum due to distance or health concerns. All tours are offered at no charge. This program is made possible with the support of the UF Center for Arts in Medicine, the Florida Division of Cultural Affairs, and the National Endowment for the Arts. Touch Tours, a one-hour program, offer people with visual impairments the opportunity to experience art in the galleries through conversation and senses other than sight. Sighted guides are provided. Topics include processes, materials and creative context. Explore your museum in the palm of your hand. Use your web-enabled device to visit harn.oncell.com. Do not touch art objects or display cases. Throw away food, beverages, gum and candy before entering the galleries. Turn your cell phone to silent mode. Turn off the flash on your cameras (non-flash photography for personal use is permitted) unless noted otherwise. Use only pencils in the galleries. Check prohibited objects at the museum’s Information Desk. This includes backpacks, large bags over 11 x 14 inches, umbrellas and rigid baby carriers. Parking is free on weekdays after 3:30 pm, and all day on Saturdays and Sundays. Monday through Friday, parking is available for $4 at the kiosk in front of the museum. Free handicap parking is available near the entrance to the museum. Groups of 10 or more planning to dine in the Camellia Court Café must make a reservation through Aramark's catering offices at 352.392.3463. Groups without a reservation will not be turned away, but a reservation allows the café to anticipate conflicts with other large parties dining during your visit. In order to better serve groups visiting the museum and expedite service, parties of 14 or more may pre-order from the group menu. Call 352.392.3463 or email cfcater@admin.ufl.edu to reserve a date, time and pre-order. Contact the tour scheduler at 352-294-7062 or via email at tours@harn.ufl.edu. The time when you suddenly see someone, whether it’s a fifth grader or an adult, start to see something in art that they hadn’t before, and they get excited about it. That for me is very satisfying and one of the highlights of being a docent.